Mara has been married to her husband Eric since 1999, and they have two sons Jacob and Collin. They have lived in Michigan and Ohio before moving to sunny Florida in 2011. Lifebridge became their church home immediately, and Mara came to know Christ here. Being born and raised in East Lansing, Mara graduated from Michigan State University (Go Green!) with a degree in International Studies and Spanish. After college, she became a senior buyer in the automotive industry. With the move to Florida, Mara became a Disney cast member in the Merchandise Planning Department. 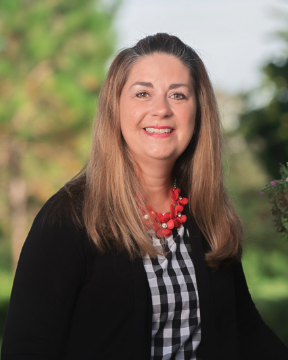 While working for the mouse was magical, Mara felt a higher calling and began working at Lifebridge Church during the summer of 2018 as Pastoral Executive Assistant. Serving is a key component of Mara’s marriage and family. They all love to serve (Galations 5:13)! Mara was involved in Awana for six years, and began working with the Youth Group in 2016. Her husband Eric is a deacon, and also teaches Financial Peace University. Jacob and Collin are both on the technical production team. Fun fact: Mara loves to run races (especially Disney races...she runs for the bling!). She has completed seven half-marathons so far, and has more in her sights for the future.